Sour Sop or Graviola is widely appreciated in many tropical regions of the world for its deliciously sweet, yet slightly tart, flavor profile marked with strong essences of strawberry, pineapple and citrus fruits like lemon and lime. But the exotic Graviola fruit, also know as Soursop or guanabana, represents a whole lot more than just savory extraordinaire, as this powerful “superfruit” is said to contain nutrient compounds that are thousands of times more effective than chemotherapy at treating many types of cancer. Scientific research published in the Journal of Natural Products back in 1996 revealed, perhaps for the first time ever, that Graviola, and Graviola seeds in particular, contain a cytotoxic compound that is literally 10,000 times more potent than common chemotherapy drug Adriamycin at treating cancer. And unlike this and other toxic chemotherapy drugs, graviola does not damage healthy cells in the process, targeting only malignant cells for destruction. The prickly-skinned fruit, which grows wild in the Amazon rainforest, is quite large and looks similar to an avocado. Inside, it contains a white, fleshy pulp that can be eaten whole or juiced. In Brazil, for example, the fruit of Graviola has long been used to make fresh juice, or mixed with milk and frozen to make fresh sherbet. The fruit can also be dried and turned into powder for distribution in colder regions where the fruit does not grow natively. Though they previously did not have the science to back up its many health benefits, native cultures have long utilized Graviola as a way to promote relaxation, fight infection, relieve depression and prevent chronic disease. Today, the fruit, leaves, stem and bark of Graviola are being used in natural cancer treatment protocols, and with much success. A new study on the herb Graviola published in the October 2012 issue of Cancer Letter has cancer researchers buzzing. 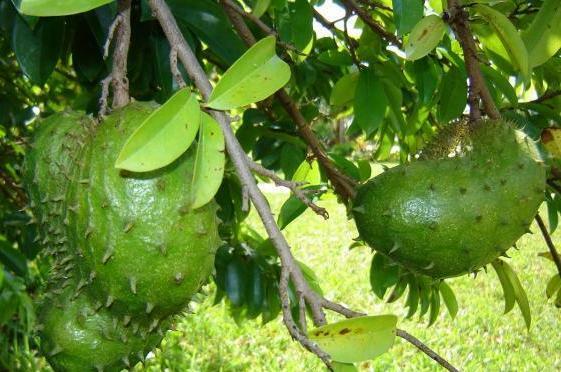 Graviola, the tropical fruit with the unusual nickname “sour sop,” stops cancer tumor cells from growing in pancreatic cancer. Scientists prove the cancer-healing abilities of Graviola in the lab and in living tissue. Oncologists agree that pancreatic cancer is one of the most difficult types of cancer to treat, and that being diagnosed with cancer of the pancreas is as good as a death sentence. The new study, performed by a cancer research team at the Department of Biochemistry and Molecular Biology at the University of Nebraska Medical Center, shows that Graviola kills pancreatic cancer cells by inhibiting cellular metabolism. This cancer tumor-fighting ability has been confirmed both in test tubes and in live subjects. Graviola works by inhibiting numerous signaling pathways that manage how pancreatic cancer cells grow, how long they live, and how the cancer tumors spread within the host. By altering these parameters, the rate of new cancer cell growth and spread of the disease slowed significantly. Nutrition and Cancer confirms the cancer- inhibiting phytochemicals in Graviola. The medical journal’s June 2011 issue includes a study on Graviola and breast cancer. In this study, scientists at Virginia Tech demonstrated that Graviola fruit extract (juice) could reduce the growth of cancer on the skin of human breast cancer patients without damaging healthy breast tissue. Mice who took 200 mg Graviola fruit extract per kilogram of food in their diet for five weeks had a significant reduction in protein expression in breast cancer tumors. Overall, Graviola extract was able to reduce tumor growth by 32 percent. Besides being a cancer remedy, Graviola is a broad spectrum antimicrobial agent for both bacterial and fungal infections, is effective against internal parasites and worms, lowers high blood pressure and is used for depression, stress and nervous disorders,” explains The Citizens Column. Leaked drug company research data proves Graviola is an amazing healing fruit. Not surprisingly, the drug industry has repeatedly tried to synthesize and patent the disease-fighting compounds found naturally in Graviola. Leaked data reveals that one unnamed drug company in particular spent seven years and hundreds of millions of dollars trying to replicate Graviola’s innate healing compounds and claim them as its own. But these efforts ultimately failed, and thanks to an insider source, we now know the truth about Graviola. Beyond this, there is also copious published science replete with evidence corroborating what this drug company found. The National Cancer Institute, for instance, has known since the 1970s that Graviola leaves and branches attack and destroy malignant cancer cells. And research conducted many years later at the Catholic University in South Korea found that Graviola seeds target colon and lung cancer cells. Previous So, What is Earthing?